CABSAT is the leading professional content entertainment event in the MEASA region. An exciting, interactive event featuring all the major global technology and content service providers for this growing industry, CABSAT continues to extend its global and regional reach. Considered to be one of the fastest growing regions in the world for Media & Entertainment at 11% CAGR versus the global rate of 5%, the MEASA region is witnessing a dramatic increase in spend driven by an audience with an appetite for the latest and hottest content. The show is the dominant broadcast, digital media and satellite communications technology platform for anyone wishing to target broadcasters, production houses and studios, animation houses, content owners and creators, software developers, telcos, systems integrators and distribution channels in the MEASA region. 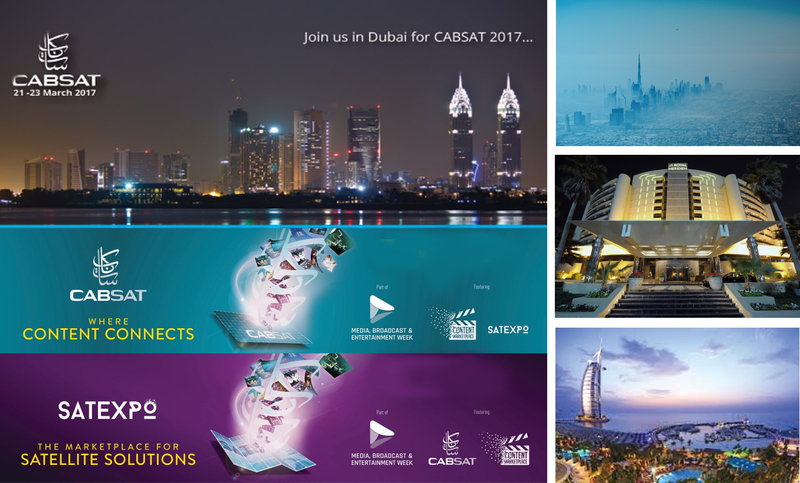 As of today we feature 9 companies and their approach at CabSat2017. This list is continously updated until CabSat opens on March 21st at Dubai World Trade Centre. The production of an international signal of a biathlon competition is one of the greatest challenges for a TV production crew. The goal for the ORF team was to deliver a top quality, unbiased international coverage in close cooperation with IBU, EBU and the local Organizing Committee Hochfilzen 2017 to a worldwide audience. To achieve this ORF hired in two HD OBVans and the related technical crew from the Belgium production company Videohouse. The clear focus of the teams of ORF and Videohouse was on the beautiful sport of Biathlon, by telling a definitive storyline of the drama of each race. ORF brought together their top qualified director, producers, camera crews and operators, experienced in the coverage of major sport events, involved in winter sports for years and devoted to capture the action, drama and intimacy of Biathlon. NEP’s UHD-41 and UHD-42 will both run four XT4K live production servers to power the creation of Teleclub live 4K replay and highlight content. The servers will provide instant media sharing capabilities between the two trucks, using EVS’ XHub3 high-bandwidth media sharing network with 10 Gigabit connectivity. They will also run EVS’ XFile3, a 2U chassis hardware and software system that has been optimized for UHD-4K workflows to meet all file-based requirements. This acts as an integrated file-based media gateway and back-up solution enabling live UHD-4K growing files. These are recorded on removable drives or network storage, and also allow file-based media to be imported in to the XT4K servers with UHD up-conversion if needed. Live X, the New York City-based production and broadcast company, ensured that the live broadcast of the legendary New Year’s Eve celebrations in New York’s Times Square went off without a hitch. Live X used Clear-Com’s Agent-IC mobile app to connect field producers via smart phones to an Eclipse HX digital matrix stationed in their office on 37th Street, while the V-Series keypanels in the OB trucks were connected over IP, using 4-wire connectivity on the panels to tie into a third-party matrix intercom system. Using Agent-IC on their phones, the Live X teams were spread throughout Times Square but remained in direct and instant communication with producers, the director and other truck staff, as if they were plugged in to a hard-wired keypanel. La Maison des Maternelles (At Home With Mothers-To-Be) - Long live "Live TV"! The television industry is having to constantly reinvent itself. Competition from and complementarity with the Internet means that it needs to rethink production methods, become more interactive, be reactive and take the plunge and do more live shows. Les Maternelles (Mothers-To-Be), a programme that has been aired on the channel France 5 for 15 years now, had a makeover this year – it's now called La Maison des Maternelles (At Home With Mothers-To-Be) and has adopted the very approach just mentioned by overcoming the challenges inherent in hosting a daily morning live show. The company Visual Compact designed and installed an original and flexible technical system on behalf of the production company 2P2L. CTV already relies on Cerebrum for major OB sports productions, such as The Open, where it enables crews to simply control and manage a huge number of external sources. Given the complex set-up for First Dates Hotel, which employed IP infrastructure to capture and manage the action remotely, the team had complete confidence that Cerebrum would provide agile and robust control as well as support a hassle-free, flexible creative workflow. A fully resilient Cerebrum system was employed, managing IP camera control units, tally, UMD contribution and linking together the main broadcast equipment including the video router and two Lawo V-pro8 video processors. Slovakia’s largest private TV station, TV Markíza, selected STRYME’s flagship product – the ultra-slim 2U 12 HD Channels GENESIX VideoServer V7 – to speed up and simplify OB-Van productions of sports, news and other live programs. Eight input and four output channels provide TV Markìza with a highly flexible Multi-Cam Ingest solution. The brand-new AutoNaming function offers cutters a clear and user-friendly structure. When it comes to live HD productions, TV Markíza demands a great deal of on-location multi-camera setups and the systems used in OB-Vans. Speed and simplicity, efficiency and flexibility as well as maximum usability and reliability are top priorities for streamlining workflows. STRYME’s seventh generation ultra-slim 2U GENESIX VideoServer with 12 HD channels (8 ingest, 4 output) meets all these needs, and more. Riedel engineers had setup a redundant digital communications network covering the whole Corviglia resort. 4.5 tons of Riedel equipment was carried up to the Salastrains finish area 2048m above the sea level! Broadcasters, stadium tv, organizers and the safety team relied on MediorNet, Artist, SmartPanel, Skype TX and about 600 mobile radios and headsets for the communication necessary to guarantee the production and distribution of the live feed to the massive LED screens (provided by NEP Faber) on location as well as worldwide. Once again the MediorNet real-time network for video, audio, and data communications was at the centre of the installation for the LOC in combination with the 600 mobile radios and hundreds of belt packs. At the FIS Alpine Ski Championships in St. Moritz, Longines presented the game-changing Longines Live Alpine Data system, consisting of a chip attached to the skier’s boot equipped with a radar and motion sensor. The Longines Live Alpine Data technology enables the real-time and continuous measurement of the athlete’s speed, acceleration and deceleration, the time it takes to reach a defined speed (e.g. 80km/h or 100km/h). The system also analysis of jumps of the athletes (speed before and after the jump and the lengths of the jump). This data is presented in the form of TV graphics to viewers at home on the TV and to spectators attending the competitions on video walls. In a second phase, it will be put at the athletes’ disposal to help them analyse their performance with ever-increasing precision. The Wingcam spans a length of 1,150m and runs above the women's racetrack with insight into the lower range of all disciplines of women and men. The line was designed and worked out together with SRG SSR TV director Beni Giger. The system is stretched between only two 18 m masts, which were also provided by Airtime Unlimited GmbH. The lower mast is connected to the Nüssli main stand at the finish area and and was manually erected. The upper mast was flown in as one piece with the helicopter and mounted on prepared ground anchors. This practice is often used when the Wingcam is used in alpine competitions. Die Fantastischen Vier - AKA iconic German rappers Fanta 4 - hit the road again on “Vier und Jetzt” their biennial tour campaign for 2016-17, reaching out to an ever loyal fan base which spans several generations and stretches across every corner of the country! Once again an equally fantastic lighting, set and visual design was created by Gunther Hecker working in close collaboration with Marc Lorenz. Gunther and Marc are a well-known FOH duo recognized for their fresh, often radical, boundary-pushing ideas and different approach! Their lighting rigs frequently contain Robe fixtures and this one followed that very trend with 60 Pointes that were integral to the epic yet raw show aesthetic developed by Gunther. An orchestral arrangement of David Bowie’s Berlin Trilogy has completed a series of sold-out concerts in Gothenburg Concert Hall and Stockholm’s Berwald Hall, with Allen & Heath’s dLive S Class and ME mixing systems managing FOH and monitors. Arranged by renowned Swedish conductor and composer, Hans Ek, and performed by the Swedish Radio Symphony Orchestra and choir Zero 8, the technical production was managed by FOH engineer Hans “Surte” Norin from Musikalisk Ljudteknink with Peter Fredriksson from PF Ljuddesign on monitors. Possibly the biggest tribute act on the planet, the Australian Pink Floyd Show has sold over four million tickets and performed in 35 countries. Recreating the authentic sound and atmosphere of the original band is one thing, BUT the ability to transmit that sound to an audience of Floyd devotees is a challenge that Capital Sound has been equal to on many occasions. For the recent UK and European theatre tour Capital were again on duty, with the experienced FOH team of sound engineer Trevor Gilligan and system tech Mark Edwards at the helm. And from the moment the band launched into Astronomy Domine followed by Shine On You Crazy Diamond, the crowd at Guildford’s modern G Live were in raptures. With a recent software update slomo.tv adds a new feature to its videoReferee® judging system for displaying scoreboard data during replay. In order to make the scoreboard available to the judges a selected portion of the scoreboard can be included as a Picture In Picture (PIP) during search and playback. This image can be selected from any recording channel containing the scoreboard or from a separate channel dedicated to scoreboard recording. VideoReferee®, which was recently used as the main video judging system during the IHF 2017 Handball World Championships in France, again adds an important feature following the demands of the video judges. Digital 6000, the latest member of Sennheiser’s professional wireless microphone range, is shipping now. Incorporating the acclaimed Long Range transmission mode and proprietary audio codec from Sennheiser’s top-of-the-range Digital 9000 series, Digital 6000 delivers impeccable RF wireless and audio performance. At the same time, the system fulfils the business need of rental companies, theatres, broadcasters and houses of worship for a flexible two-channel wireless solution that allows the use of existing accessory infrastructures. Designed for demanding live productions, Digital 6000 also addresses the challenges of the shrinking UHF spectrum: The system eliminates intermodulation, enabling more channels to operate in less spectrum space. Recognizing the potential of Facebook Live, the Meredith TV Group issued a corporate directive to their digital content teams at its stations to use Facebook Live to reach new viewers that tune into social media more often than TV, connect with loyal viewers outside of normal news cycles, and serve as a trustworthy news source for the Facebook community. “Since live video news is a key service that we provide, Facebook Live presents a unique opportunity for us to raise the visibility of our media brand on Facebook, and to share the timely, trusted news programming that airs on our main channels,” explains Larry Oaks, Vice President of Technology, at Meredith Corporation. Panasonic have supplied the new TV broadcaster Nowa TV with a professional system of studio cameras based on the 4K AK-UC3000 models. The channel has been available throughout Poland since 9 October via terrestrial broadcasting in the Mux 8 multiplex. It is also transmitted through all cable networks in Poland. The signal is broadcast in FHD resolution but the entire infrastructure and equipment support 4K. Nowa TV is a free, universal TV channel that has been available since November in the Mux 8 multiplex. Just like Polo TV, Focus TV, and Eska TV, this new channel is owned by Grupa ZPR (Zjednoczone Przedsiębiorstwo Rozrywkowe): one of the largest radio, press and TV publishers and website owners in Poland. Launched in October 2015, UHD pioneer INSIGHT TV is the world’s first channel dedicated to solely shooting and broadcasting content in 4K UHD 50 fps. INSIGHT TV works closely with distribution partners including Sky, Vodafone Portugal, Vodafone Spain and Swisscom and production companies such as Sky Vision Productions. In September 2016, INSIGHT TV announced its partnership with Samsung, which saw the launch of the world’s first fully UHD SVOD service for Samsung Smart TVs. Powered by the NeuLion® Digital Platform, INSIGHT TV’s SVOD UHD app, which allows viewers to watch over 200 hours of original, non-scripted UHD content, features innovative documentaries, accessible reality series and cutting-edge factual infotainment, as well as high levels of interactive new formats. The service, which has already launched in Benelux, will be expanded to customers in Europe in the coming weeks.